The Union of South Afica was established in 1910. The union consists of Cape of Good Hope, Natal, Orange Free State and Transvaal. 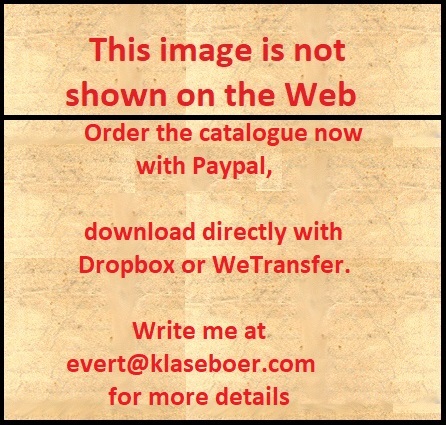 Many stamps exist with the country name in two languages; English (South Africa) and Afrikaans (Zuid Afrika, later changed to Suid Afrika), mostly printed side by side. Later stamps bear the abbreviation (R.S.A.). For the specialist; this stamp has perforation 14 and watermark 'Multiple roses'. Many types with small differences were issued over the years for the 1/2 p, 1 p and 6 p stamps. I have seen the 1/2 p overprinted 'DOUANE' (fiscal stamp). Stamps with surcharge 'S.W.A.' or 'South West Africa' were used in South West Africa. 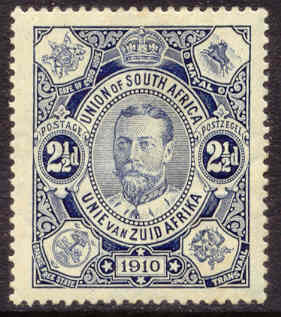 Later postage due stamps have the inscription 'South Africa' on top (1927 onwards) or 'Republic of South Africa' (1968). I have seen the following values in the same design: 3 p green and black, 6 p red and lilac, 1 Sh lilac and brown, 1 Sh blue and lilac, 2 Sh green and brown, 2 Sh 6 p orange and green, 5 Sh brown and grey, 10 Sh green and lilac, 1 Pound red and green and 1 Pound grey and blue. Other values exist, varying from 3 p to 25 Pounds. A similar type was issued in 1931.